We are excited to see an increased number of firms this year offering unlimited time-off programs. We also learned about the gains that firms are experiencing in recruiting and retention efforts by employing flex benefits. What is your firm doing to increase flexibility and Anytime, Anywhere Work™? If you have examples to share or want to ensure that you participate in next year’s survey, email Renee Moelders. If you would like to receive our future survey posts, plus our other weekly blog posts, subscribe to our Inspired Ideas blog by clicking here and providing your email address in the “Subscribe Me” field. 80% of respondents were from the all-important Millennial generation, aged 21-33, with 20% coming from the 34-40 age group. Male and female respondents were about evenly split at 51% and 49%, respectively. Topics discussed include the importance of work/life balance, flexibility, and clarity of their growth path. The survey also explores key differences explored between CPAs and Non-CPAs; men and women; various age categories; and varying levels of experience. 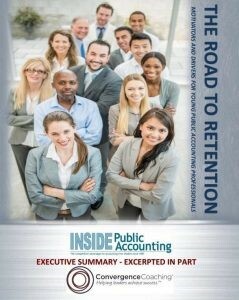 Download the executive summary and order your copy of the report here. Want to Keep Your Next Gen Leaders? Make These Changes ASAP! Accounting Today Podcast: Why won’t partners change? If you or someone in your firm is seeking structured, long-term opportunities to develop leadership or business development skills, consider enrolling in one of our comprehensive professional development programs. Registration is open for both our 2017 Spring Transformational Leadership Program™ (TLP) and Rainmaker Development Program® (RDP). Participants focus on development in three specific goal areas that are tailored to their development objectives and they undertake an in-firm project that benefits the firm and stretches them in ways that reinforce their development. Begin the transformation process for your high potential managers, senior managers, principals/directors, and new partners by enrolling them in our 2017 Spring TLP. 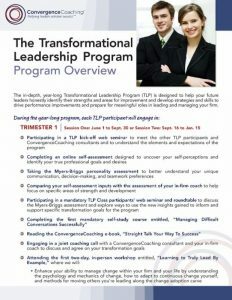 For more details about the TLP, read our program overview or to register, visit convergencelearning.com/tranformational. The one-year investment to transform each up-and-comer into a true firm leader is $6,500 and the class size is limited to 26 participants. The ability to develop business is a skill that most firms seek in their future leaders. It is also the one area where professionals feel most uncomfortable. If you have one or more professionals who wish to become better business developers, consider enrolling them in our public Rainmaker Development Program® (RDP). This 6-month program provides a mix of learning and “real life” experiential activities to build real skills in personal marketing and business development. During the RDP, participants engage in six virtual roundtable sessions, with video cameras deployed, on buildable topics related to critical personal marketing and business development concepts. Between sessions, RDP participants will be tasked to complete assignments, reporting their progress by the next session. In each subsequent roundtable, we discuss challenges and successes, learn the material for the next personal marketing concept and agree on a new assignment to facilitate real learning and progress. Our RDP is limited to 12 participants from firms across the country. The cost to participate in the RDP is $1,995 per person, including CPE credit. One new closed engagement will more than return your investment that should result from the learning in each session and homework activities. For more information or to enroll in the RDP, visit our Learning Center. 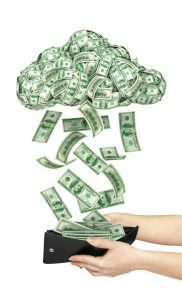 If your firm has up to 12 individuals interested in elevating their rainmaking skills, we can also facilitate a custom program specifically for your firm. For more information about the TLP and RDP, or to learn more about a custom program for your firm, contact Brianna Johnson by email or by phone at 402-639-4132. We truly admire our clients and friends that were honored as one of Accounting Today’s 2016 Best Accounting Firms to Work For based on a two-part survey evaluating workplace policies and practices and anonymous employee feedback. Congratulations to Barfield, Murphy, Shank & Smith LLC, Bland & Associates, P.C., Gelman, Rosenberg & Freedman, Haddox Reid Eubank Betts PLLC, HoganTaylor LLP, James Moore & Co., Marvin and Company, P.C., Johanson & Yau Accountancy Corporation, MiddletonRaines + Zapata, LLP, Pannell Kerr Forster of Texas, P.C. (PKF Texas), Smith & Howard, Smith Leonard PLLC, WellsColeman, Wilkin & Guttenplan, PC, Williams Benator & Libby, LLP and Windes, Inc. We are so proud of your investment in your team and culture! Congratulations are also in order to our friends and clients that were named to Accounting Today’s 2016 Top 100 VAR list including: Arxis Technology Inc., Central Consulting Group, Eide Bailly, Stambaugh Ness Business Solutions, and Warren Averett Technology Group. Congratulations to your teams! We are grateful that you have taken the ConvergenceCoaching leap of faith and look forward to making a difference for your organization! Top 100 Most Influential People and Most Recommended Consultants for 2016! 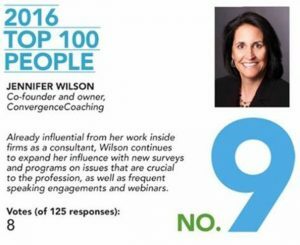 Congratulations to co-founder and partner, Jennifer Wilson, for being recognized as one of Accounting Today’s 2016 Top 100 Most Influential People in Accounting, this year ranking in the top 10. 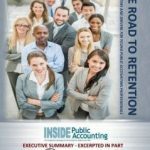 Jennifer is also grateful to be recognized by INSIDE Public Accounting on their list of 2016 IPA Most Recommended Consultants! Thank you to the award and list sponsors and also our clients and friends for their continued support of our mission to transform teams, drive change and help leaders achieve success. We are humbled and grateful. > Market Prominence: What Does It Take to Dominate Your Market? Take a look at the content and register today! We’d love to see you so let us know if you will be attending any of these events. To access our catalog with a complete listing of topics for speaking, teaching, and custom in-firm programs, visit www.convergencecoaching.com/learning. If you know someone who would benefit from receiving their own copy of our Coaching Concepts e-newsletters along with invitations to our web seminars and other events, e-mail their information to us at info@convergencecoaching.com.